Wherever you live in the world, one thing remains the same - lawns and gardens need to be adequately watered in order to remain healthy. Have you ever stepped onto the grass in your backyard and felt the grass kind of crunch under your feet? Or turn around to see that instead of springing back up after you’ve walked across it, your grass just lies flat? That’s because it’s lacking moisture and is not being watered sufficiently. Sprinklers are good, but if you keep them running continuously, they use a lot of water. Really, you need someone to be able to monitor the sprinkler to make sure the garden’s not being overwatered. The other downside to sprinklers is you can’t hang your washing out at the same time! One of the quickest and easiest solutions to this manually watering your garden through the use of a garden hose. But before you set off to give your grass the nourishment it needs, you might want to take a moment or two to consider what kind of garden hose nozzle you need. Where you’ll be using the garden hose, will help determine the type of nozzle that you’ll need. For example, if you’re in the process of growing any kind of plant or crop, you’ll probably find that a nozzle with a shower or mist option is more what you’re looking for. 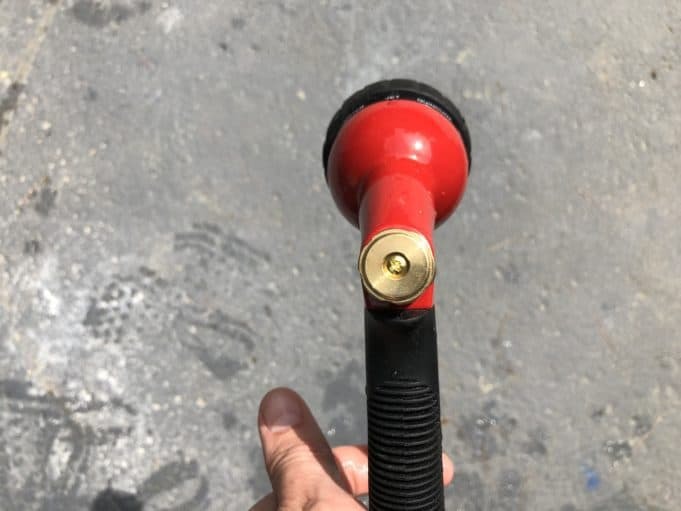 However, if you plan on using the nozzle for other tasks such as cleaning windows or washing the car, you may want to opt for a nozzle that has some kind of jet spray pattern. This is another thing to consider as not all spray nozzles have a locking mechanism to help keep it on the setting you need. Those that don't require users to have pretty strong hands and wrists, and therefore may not be suitable for kids or the elderly. 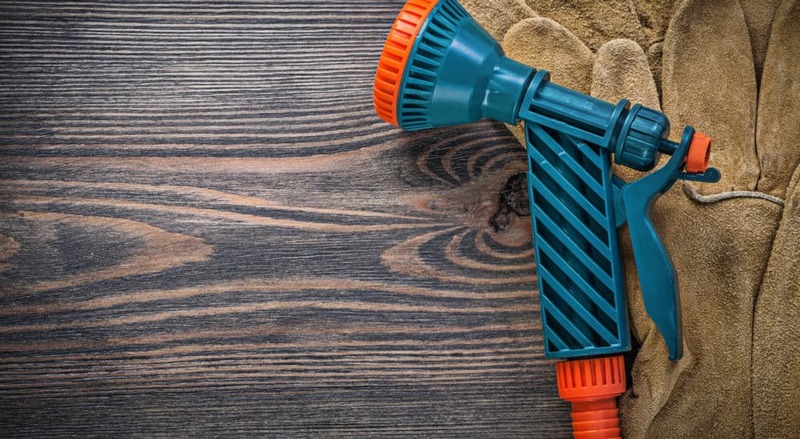 As mentioned briefly above, garden hose nozzles are very simple inventions that consist of two main components: the sprayer and the handle. These nozzles are usually made of either metal, plastic, or a combination of both. Quite often metal nozzles are powder coated to make them more durable and less likely to rust. The most commonly used metals are brass, aluminum, stainless steel, or construction die-cast. Nozzles made using a combination of metal and plastic are also pretty durable. Most often they will consist of a metal nozzle and a plastic handle. With these models, you get the best of both worlds as you get the strength and durability of a metal nozzle, and a lightweight and comfortable handle to hold. Beware of garden hose nozzles made of just plastic. While these are no doubt the least inexpensive of nozzles, they’re also the poorest of quality and are likely to break after a couple of uses. They’re also more prone to leaking and can deteriorate quite quickly if exposed to sunlight over a long period of time. Traditional. 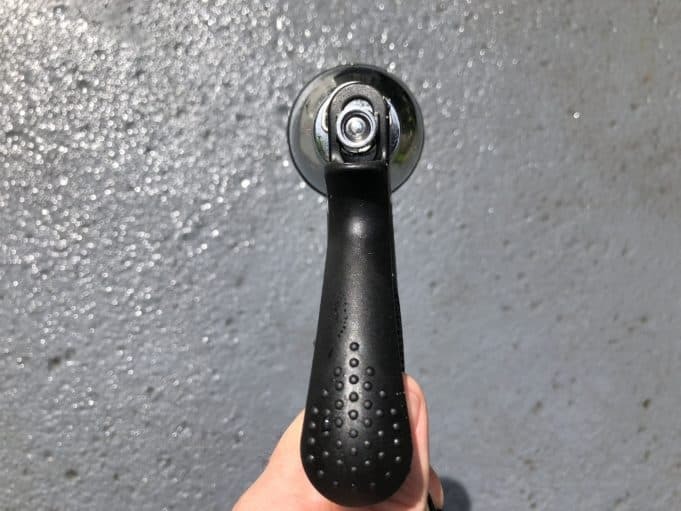 Nozzles that are classed as traditional are those which have a straight barrel that’s twisted in order to regulate the amount of water allowed to flow through. With a just a quick twist, you can switch from a fine misting spray to a more powerful stream. Pistol grip. These nozzles look and work in a similar fashion to a handgun. Simply point the nozzle and press the trigger to start the water flow. To stop it, release the trigger. Dial or turret. Nozzles that are of a dial or turret style employ the use of a dial in which to adjust the spraying pattern. Typically these will have anywhere between two and ten different spray patterns including a jet spray, fine mist, or soak option. Watering wand. This type of nozzle extends outwards and was designed for getting to those hard to reach places. Most have a cut-off valve towards the base of the wand, allowing you to stop the water supply without going to the faucet. Fan. These nozzles spray water outward in a fan-shaped pattern. They’re ideal for use on plants and in small gardens. Fireman. This is the kind of nozzle to use if you need a higher water pressure for whatever reason. But they don’t just allow high water pressure. You can also switch to a fine misting if preferred by simply twisting the nozzle. Soaker. A soaker nozzle doesn’t actually spray water. Instead, it allows water to drip out. These are perfect for using ib newly planted trees or delicate plants. As a rough guide, most garden hose nozzles will put out around 2.5 to 5 gallons of water per minute. While most manufacturers will advertise this number, it’s not hugely important. 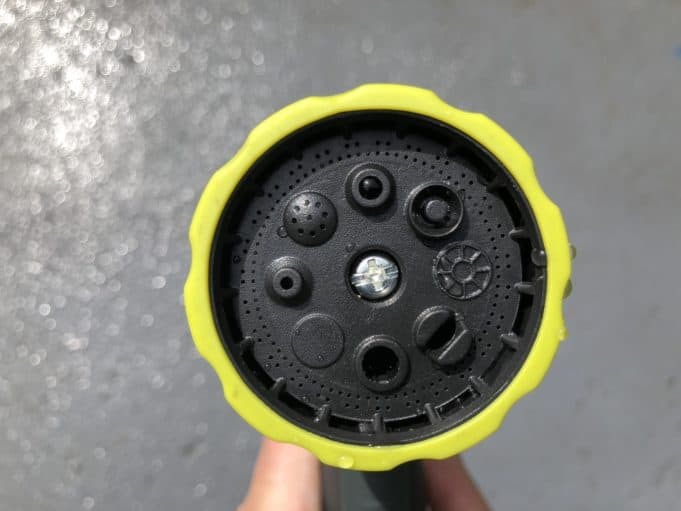 You’ll find that the majority of garden hose nozzle connectors are made from either plastic or metal. Most screw on, but there are some models out there that are quick connecting and just snap on for easy convenience. 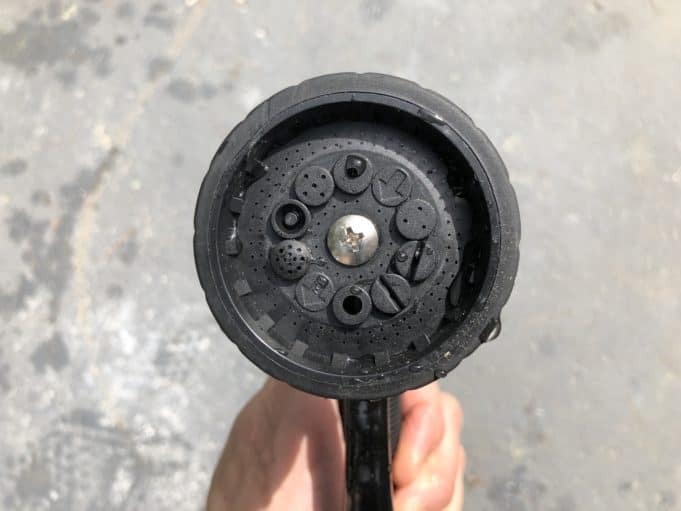 A garden hose nozzle isn’t something you tend to replace very quickly - provided you buy a decent one in the first place. Before you make your purchase, just double check the quality of the item to ensure it’s durable and likely to withstand years of outdoor use. While you’re not going to be watering your lawn every day, when you do use it, you don’t want to be working with something that’s bulky and uncomfortable to hold. Look for a hose nozzle that’s lightweight and easy to operate, even for those who don’t have a super strong grip. Most garden hose nozzle you come across will have a shut-off valve. This will enable you to stop the flow of water by either twisting the nozzle, rotating a barrel, releasing a trigger, or moving a valve. It’s quite a useful feature for people that live in areas where water use is limited due to extreme weather conditions, such as during a drought. We're going to start with my favorite overall, the Gardaco. While it doesn't feel like a solid ingot of metal like the Gardenite, the Gardaco is very solidly constructed and feels a bit lighter in your hand which is a benefit. This seems to be a nozzle that will hold up well over time. The Gardaco has a nine pattern selectable dial, which I think is plenty of patterns, probably five more than I actually use. It does have the soaker, shower and mist patterns which are key for garden and flower watering. It also comes with extra rubber washers to prevent leakage over time, which is nice if you can keep track of them. 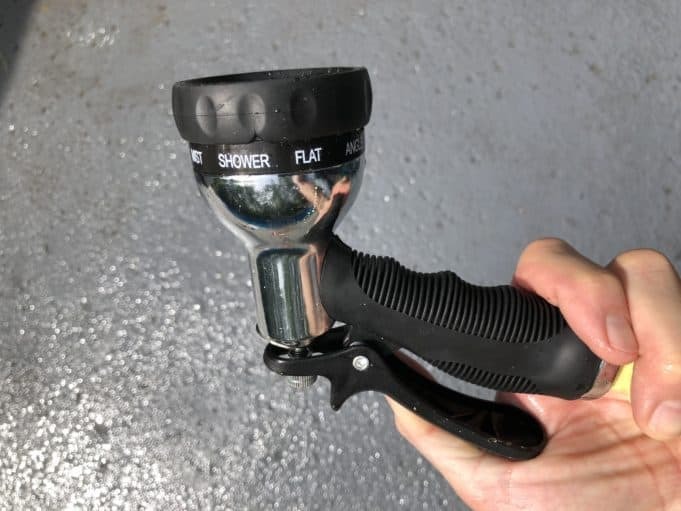 I think as a general innovation for hose nozzles, they should build the gaskets into the rubber handle and let you peel one off when you need it. That would help people like me who tend to lose stuff. For each of the nozzles I ran a test where I put them on the jet setting and sprayed them across the yard at my garden. This isn't the way I (usually) water the raised beds, but it's a helpful test to see how far it goes and how tight the spray pattern stays. I use the jet setting more than any other, primarily to clean things around the yard. My only minor quibble with the Gardaco is that if you want a constant flow of water it has one of those small metal triangles at the top to hold the lever in. While they work, I find those a little fussy. They can get stuck in the down position and just aren't as nice as the ones that hold the lever from the bottom. With a combination of solid construction, great performance and value pricing, the Gardaco was my overall favorite. It's not the cheapest option and isn't all metal construction, but it's the best value for the money in my opinion. 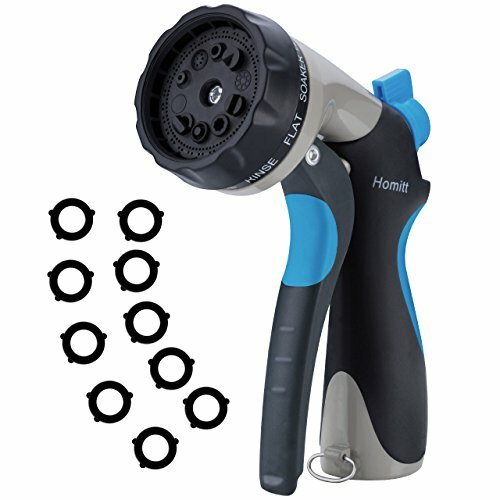 I'm reviewing the Homitt, but I didn't take a video of it in action because it is exactly the same nozzle as the VicTsing below, just with two more spray patterns and in a different color. They are sold under different names but it's obvious to me that they rolled off the same assembly line. With the hybrid design of this Homitt, you get a nozzle that’s made of metal and a handle that’s made of plastic. So not only is it pretty robust, it’s also very comfortable to use. The 10 different spray patterns allow you to alter how you use the product depending on what you need to water, There are patterns that are suitable for watering flowers, grass, the car, and more! And what I also love about this nozzle is how easy it is to use. Simply turn the dial to select the type of spray pattern you want, pull the trigger, and away you go! There’s a side valve in which to control just how much water flows through and it’s leak-proof design helps to ensure you stay dry while watering. It even comes with 10 washers in which to tighten the seal. Lastly, if you do encounter any problems, the manufacturers offer a 12-month free guarantee. In terms of application, this hose nozzle works extremely well. It’s also pretty lightweight and easy to get a grip. I wouldn’t say it’s completely leak-free, as it does sometimes drip when in use. It comes with extra washers, which is nice but I'll never be able to keep track of them when I need them. It's also hard to recommend it because it's a few dollars more than the VicTsing and again, it's exactly the same unit. A garden hose nozzle doesn’t have to be expensive to be effective. 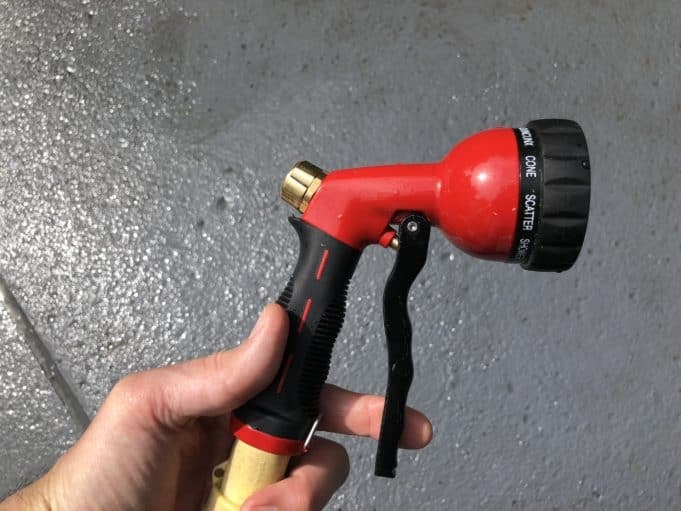 If you’re looking for a model that’s inexpensive, works well, and not going to fall apart after a few uses, then the VicTsing Garden Hose Nozzle Spray may be just what you need. 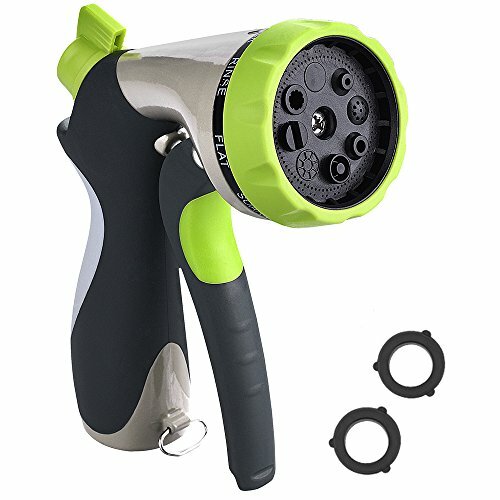 Weighing in at just 10.4 ounces, this lightweight garden hose nozzle comes equipped with 8 different spray patterns including a cone, mist, jet, shower, and soaker option. One of the things I like most about this nozzle is its hard-wearing design. 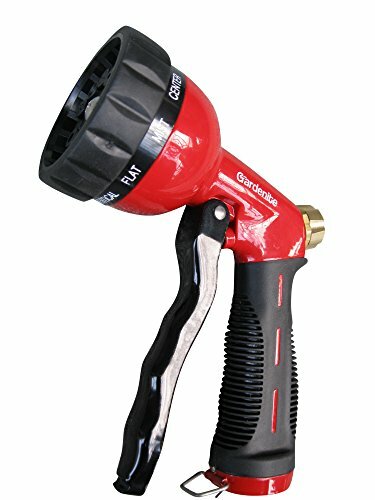 The body of the nozzle is made of a robust steel, while the handle is covered with a rubber coating to ensure you get a good grip. It’s also very easy to use. Simply turn the dial to the required watering setting and hold down the front pull trigger. Many people find that front pull triggers are easier to use as they feel much more natural. There’s even a clip that allows you to leave the sprayer on continually without holding the trigger if you prefer. For what we would consider a budget garden hose nozzle, this is a fantastic product. It may not be quite as high quality as some of its competitors, with some of the parts being a little cheaply made, but it looks pretty cool and does what it says it will. That being said, I am pretty confident that this model will hold up well. 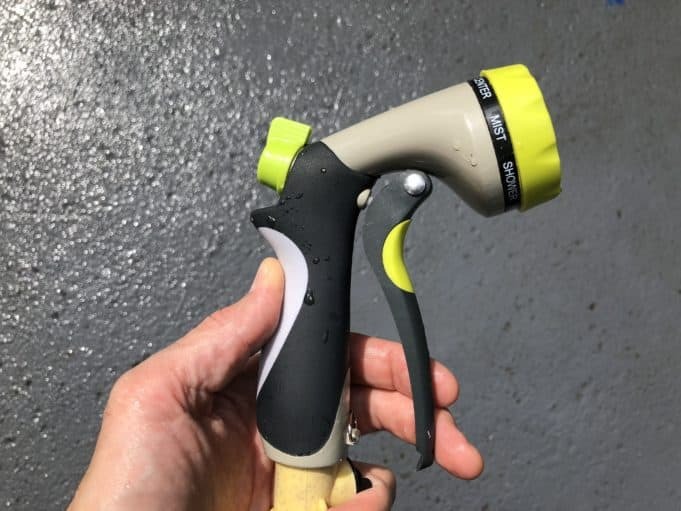 If you’re like me, and a bit of a garden geek, then you may want to consider getting your hands on a garden hose nozzle that’s a slight cut above the rest in quality. And if that’s the case, then be sure to feast your eyes on the Gardenite Garden Hose Nozzle. Made of solid metal with a baked enamel finish, this nozzle is one of the most robust models I’ve seen. And even though it’s made of heavy-duty metal, it’s surprisingly lightweight and really comfortable to use. 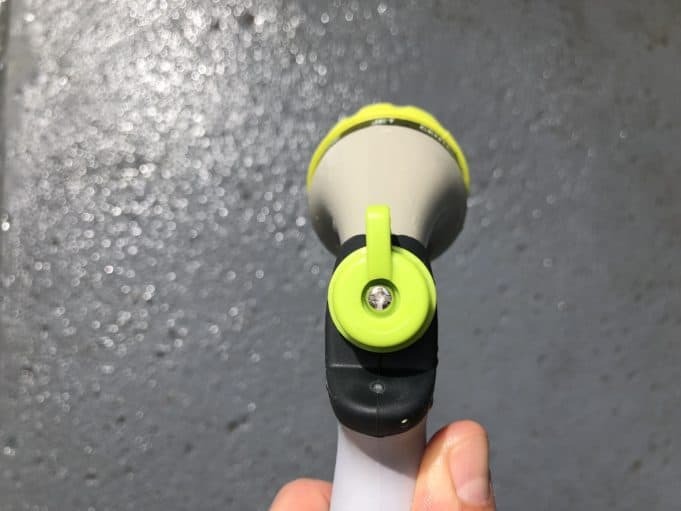 There are 10 different spray patterns in which to choose from while using this nozzle including a soft shower option to water your plants and a high-pressure jet setting when you need to clean those hard surfaces. And, it’s a front pull trigger design, which in my opinion, is a more natural feeling and easier to use than those with a rear push lever. 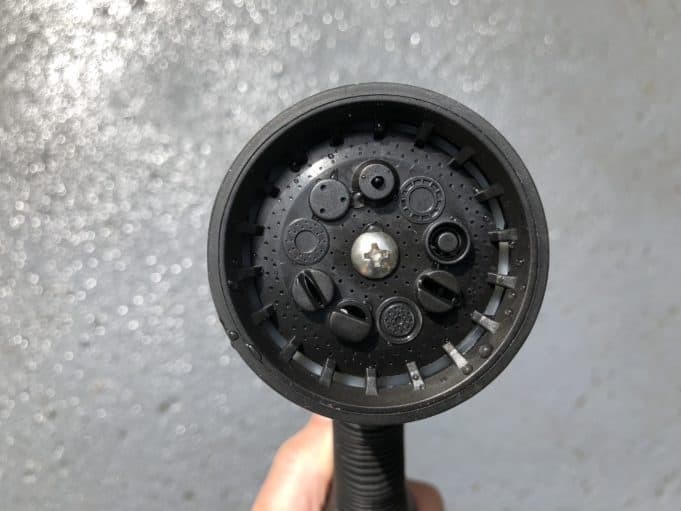 One of the best things about this garden hose nozzle is that you can adjust the water flow from high to low, in any setting, with just a turn of the flow control knob. Never again will you suffer from poor water pressure. There are a couple of minor pitfalls to report. The first is that there is no soaker spray option. And while this may not be a dealbreaker, it is a little annoying considering. The second issue is the price. It’s around double some of most average models on the market. That being said, they are average, and this model is more high-quality. 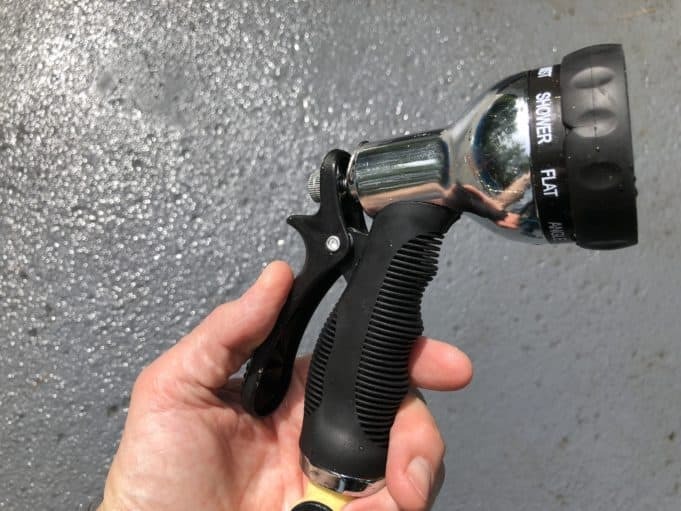 We hope you found the above article informative and are now just about ready to make your next garden hose nozzle purchase. 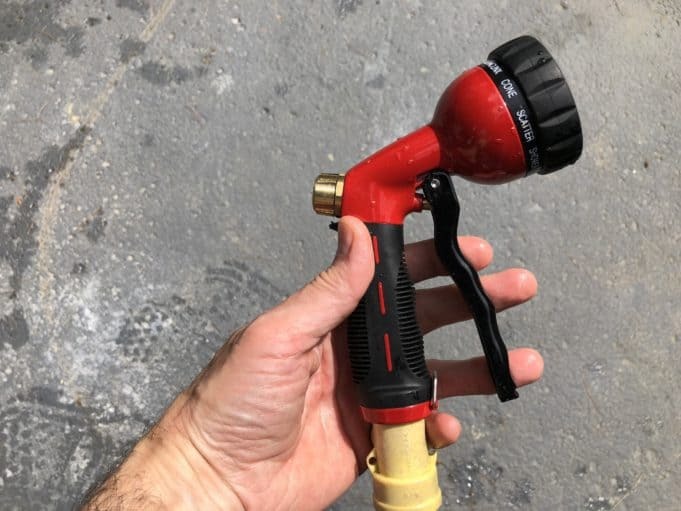 Just remember, if you’re looking for a simple model that will work straight out of the box and won’t cost you a fortune, the VicTsing Garden Hose Nozzle Spray is the way to go. 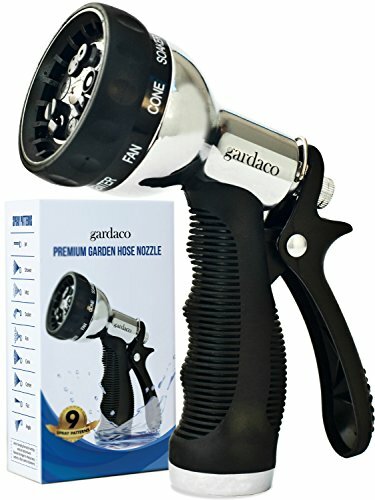 If you’re looking for something a little more high-quality and heavy-duty, be sure to check out the Gardaco Garden Hose Nozzle.